Good morning! 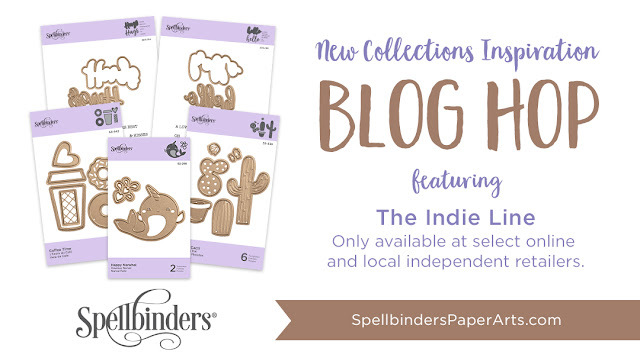 I'm excited today to be hopping with Spellbinders featuring the Indie Line, available only from select retailers! 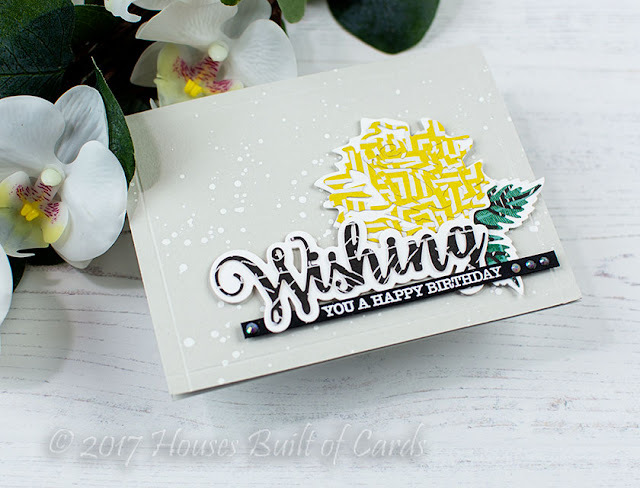 You can find it HERE at Simon Says Stamp - or check on the Spellbinders Blog for a more complete list! I decided to die cut the flowers from Layered Rose Etched Dies using a mix of white cardstock and pattern paper. I cut the base layers using white cardstock, then both of the flower layers in the same pattern paper for a soft layered look, and two colors for the leaves. I did the same thing with the word dies from Wishing Expressions Cling Stamp and Die set - white cardstock for the base layer, and then pattern paper for the detail layer. For my cardbases, I used Fog cardstock from Simon Says Stamp - a nice soft gray. I added score lines around the edges to form a frame, then added some white paint splatters. 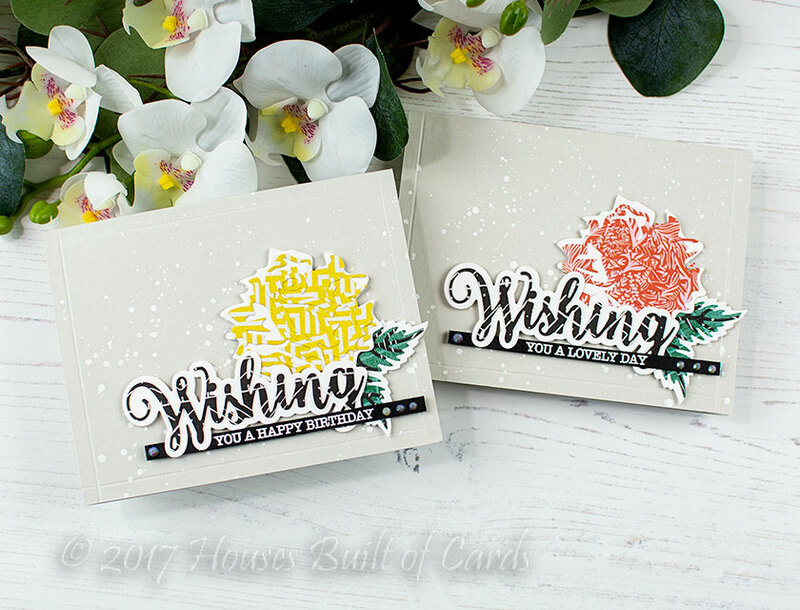 I heat embossed a sentiment for each card from Wishing Expressions Cling Stamp and Die set on a strip of black cardstock, and layered everything on the cardbases with foam adhesive. I finished off with a few white jewels from Pretty Pink Posh on the sides of the sentiment strips for a bit of sparkle! 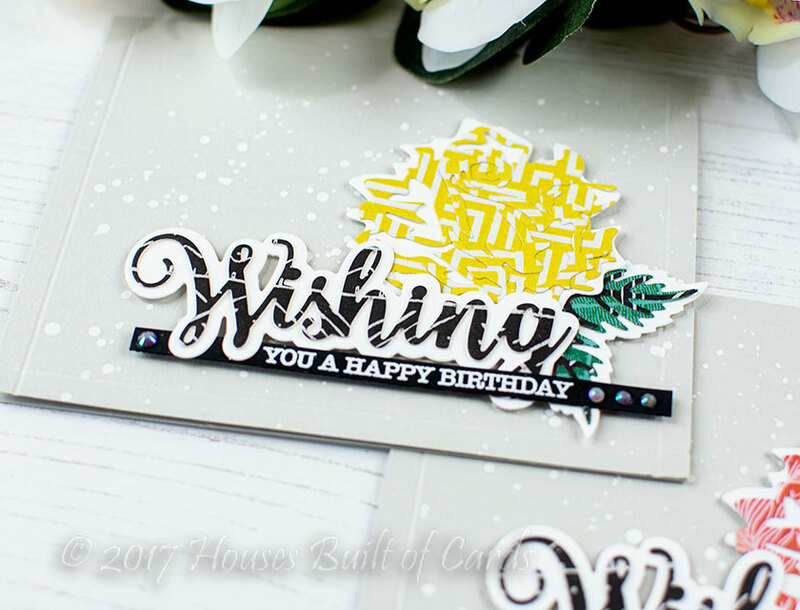 There is a $50 gift certificate up for grabs on the Spellbinders Blog - AND, I get to give away a $25 gift certificate to the Spellbinders Store on my blog here! So make sure and leave a comment before you leave to be entered. Comments must be left by 11:59 PM EST on Sunday, July 15th. Very pretty cards! Such an awesome collection! Love the beautiful Layered Rose set of dies and all of the Expressions sets! What a fabulous release! Pretty cards! Cards are looking beautiful.Thanks for the inspiration! Gorgeous colour palettes on these cards. Thanks for the inspiration. Beautiful cards! I love the colors. Love your roses using the patterned paper as one of the layers...very pretty! A very unusual look to the layering dies! Love these cards. This 'wishing' set is my favorite of the release - I just love it! And your card is so pretty! Love your use of the patterned papers. Amazing what different looks you get with various prints instead of solids! I would not have thought of that! Beautifully done. Love the colors! Interesting use of the patterned card stock on the roses. It gives the roses a whole different look. It took me a minute but I do really like the look of the patterned paper for the die cuts. Unusual and elegant, I like that! Unique cards! I really like the use of patterned paper for the roses very pretty!! This is so interesting! What a neat effect! Thank you. Love the cards! Thanks so much for the inspiration. 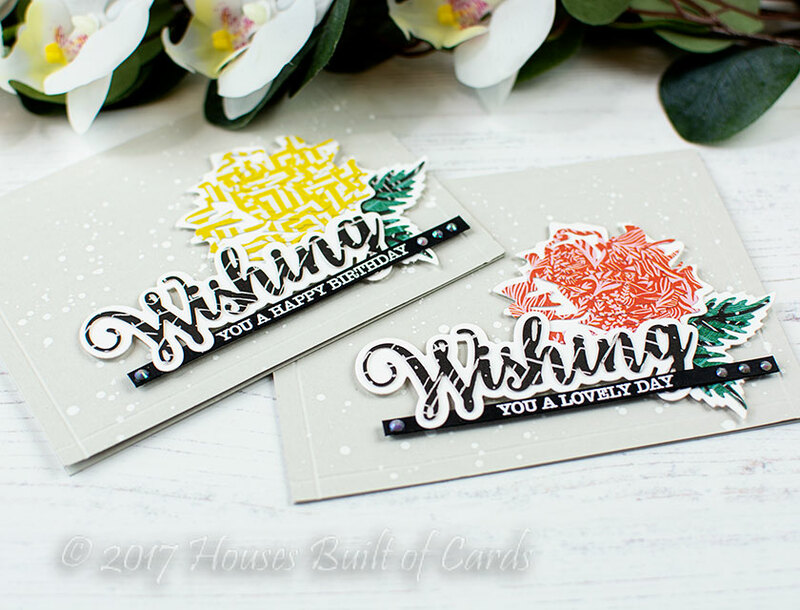 What gorgeous and elegant cards ..these dies are so very pretty. Beautiful cards. I love the Expressions dies from this release. Beautiful cards Heather. Love the details on these dies... fun patterns! I love the large word dies in this line. The Wishing is so pretty. Nice technique using the pattern paper where you did. The printed papers give these layered dies an entirely different look and I really like it. Beautiful cards! I am always so impressed when I see pattern paper in die-cuts...and it's so pretty! Super cool cards! I love how the layers of patterned paper play against each other. The gray background is perfect to let the blooms shine. Love the card. The idea of using pattern paper is really cool! Loving the papers you chose for this and the subtle dimension the dies brings when used with the pp. What a neat idea with pattern paper for the details. Thank you for sharing. Gorgeous cards!! 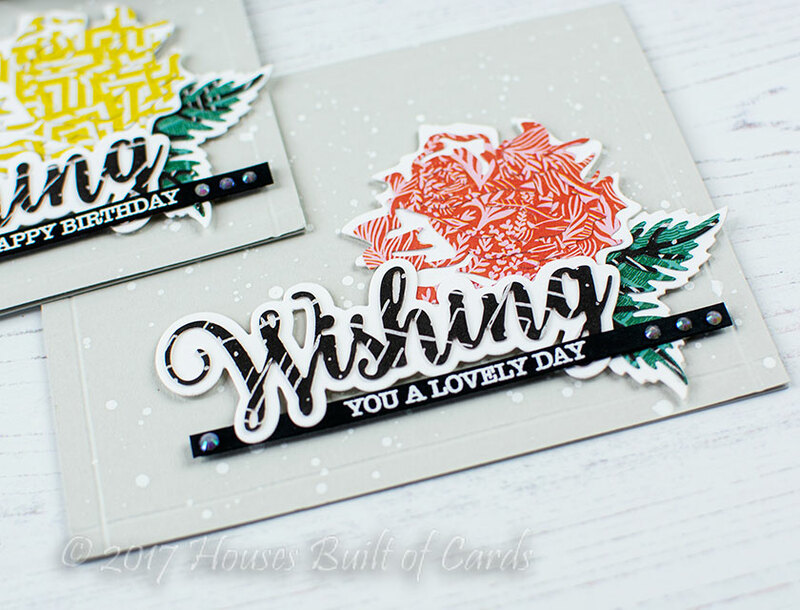 Love how you used the pattern paper with the layering dies!! 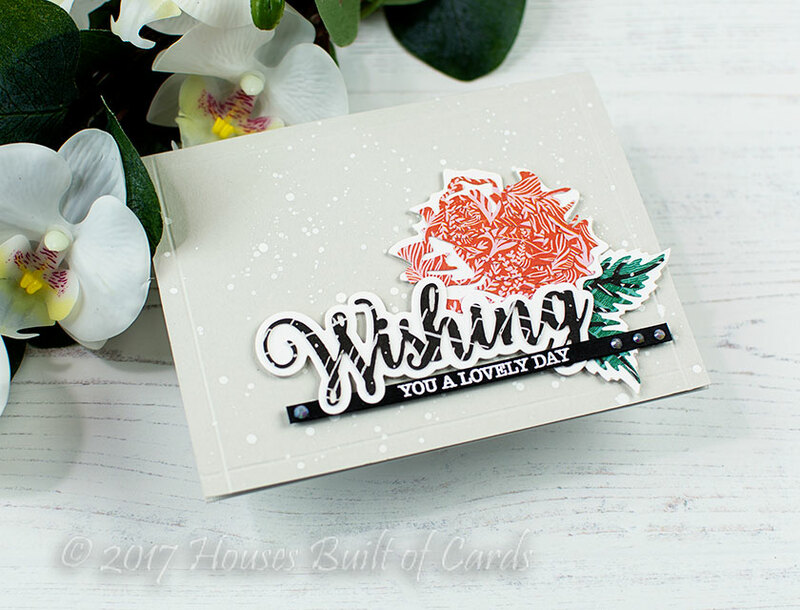 The Layered Rose looks so interesting done in patterned paper! Very pretty card! All of the word stamp and die sets are great! But I pretty much love all of the new dies! Thanks for the inspiration! Pretty and unique with your use of patterned paper. Love how you've used the indie collection layering dies and sentiments for these wonderful cards! Who can pick a favorite? TFS. Unique look using pattern paper.. The dies are so pretty! Love your card ideas. Great design.